In the virtual world of hash-tags, repost, likes, shares and subscribe, social media plays a significant role in marketing as well. Though it is platform to connect with people around the globe and stay updated on the current happenings, it is also proving to be a great place for earning customers for your brand. As Statista suggests, by 2019, there will be approximately 2.77 billion social media users in the world. Imagine those many people knowing and connecting with your brand! Wouldn’t it be a successful platform to advertise and promote your products, services or brand? We bet, it will be! Curating a list such key points, in this blog, we will be discussing the power of social media in the 21st century. Why Is Social Media Marketing Important Today? Social media marketing has completely transformed the traditional marketing approach. While once new products were announced and marketed using print, broadcast and referral approach, with social media marketing things are simpler and easily accessible. And, if you are still going old school, you’re incurring a huge loss for your brand or organization. With that being said, let’s discuss why is social media marketing important? And, how avoiding it can cost your business a significant loss! Everyday millions of people scroll through a number of sites to find a product or service of their choice. Regardless of the industry or sector, social media provides you an opportunity to connect to those people. Every content, advertisement, video or infographic you share on social media platform increases your chances of interacting with your audience. Brands like Nike, Dove, Coca-Cola, L’Oreal, etc., are perfect examples of audience engagement and interaction. And, we all know, how successful they are. Thus, it is fair to point that social media marketing helps in understanding your audience better than any other marketing approach ever could. Besides, connecting to the target audience is easier and more personal through social media. All you need to do is – keep your social posts interesting and enlightening. The rest will take its course step by step. Happy customers are loyal customers! And, they further bring more value with themselves. For instance, how many times have you recommended your friends or family a shopping site just because you were satisfied with its service? We guess, many! Similar is the case with social media marketing. If your audience is happy with your campaigns and services your brand is offering, they will promote it without saying. As per facts, 71% of clients who had a positive social media service experience with a brand are likely to suggest it to others. And, this is not all! With just the word-of-mouth your brand can gain customers you didn’t even know existed. In other words, connecting to the audience through social media is the fastest way to create brand awareness. As we say, it works like a grapevine. From one person to another, the information travels so fast that the future of the product or service can be easily determined given the type of response you get from your audience. Social media marketing totally works on the type of content you are sharing with your audience. Brands that have the best products and have deep understanding of the benefits of their products impresses the audience the most. For a simple reason, the audience or customers are curious to know everything about the product you are proposing to them. Until and unless you offer them the best of the knowledge of the product, they might not trust your brand. That’s the reason why brands focus on promoting their survival story, history and testimonials. These types of posts tell the customers what’s unique about the brand. As a matter of fact, it builds trust of the audience in the brand. Other than this, being transparent with your customers is another strong authority building social media strategy. Brands address criticisms as they arise, which can help in gaining the faith customers place in your business. Social media marketing is a prompt, inexpensive, and the most effective way to reach a wider audience. It helps you cut unnecessary marketing costs, without compromising the output. How? Well, as a matter of fact, social media platforms include millions of potential customers, colleagues, and competitors. And, they are accessible to everyone for free. Also, an average Facebook ad costs $0.97 which is way less than what you would have paid for printing out a few flyers. Other than this, social media marketing also acts as a real time saver. According to statistics, 95% of the marketing professionals who use social media confirmed that just by spending 6 hours per week on social media increased exposure for their businesses. Could you expect any better way than this for marketing? Another major highlight of social media marketing is the fact that it helps in driving organic traffic to your brand’s website. As you post content with keywords and images related to your brand and category, it attracts new potential customers to your site/page searching for the same. The more knowledgeable your content information is, the higher the chances of driving traffic to your website. In addition, being active on social media also draws traffic to the website/page. The improved visibility and engagement with the content helps to boost its reach. And, therefore, is an imperative part of any strategy to develop organic high quality back-links. Other than that, optimizing your brand’s social media profile helps in making your brand appear in the organic search listings. As per statistics, marketers who have been using social media for more than 3 years say that it has helped them increase sales. The major reason behind this progress is that your audience is way more active and approachable on social media. Besides, when you amalgamate your brand with the known faces, it attracts your potential customers. For instance, travel influencers like Johnny Jet, Chris Burkard, Louis Cole, etc., have a huge number of followers on their social media accounts. People tend to visit the places, try food joints, and take part in activities suggested by them. Thus, their partnership with various brands likes Marriott, Toyota, MTV, Greyhound, etc., helps the companies in driving sales. All you need to do is partner with these influencers to feature your product in their posts, pictures or videos. Also, you can have them tell an appealing story or journey of your brand. And, that is not all! When the influencers give open reviews about your brand or provide tutorials about your product/service, the audience ought to try it. As a result, increase in sale and popularity of the brand. Maintaining online reputation of the brand is significant as one bad review from an unsatisfied customer can bring a wedge to your business. As per a survey by BrightLocal, 88% of the people confirmed they trust online reviews as much as they trust personal recommendations. Therefore, it is only fair to say that if your brand develops a bad reputation on social media, you might lose your customers. For instance, brands like Adidas, Dove, Uber, McDonald, etc., experienced negative response from the audience due to their appalling social media campaigns. However, they were quick to remedy it by apologizing or withdrawing the services at once. In other words, defamation itself may not damage your brand. But, the way your brand responds to it can straightforwardly impact its reputation. Thus, always try to be pro-active remedial on the comments or reviews left by the customers as they can make or break your brand reputation. Unless you are just looking for a way to survive in the market, it is imperative to establish a connection with your audience. People must know that they are not just a potential target for your brand. And, you are not just an establishment looking for a way to make money. The audience should believe in your brand values and how your product or services are developed keeping in mind the best interests of the customers. The simplest way to achieve this is through social media. Instead of copy-pasting or relying on automated replies, try to know your audience. Understand their concern and reply accordingly. Most of the times what puts off a consumer is negligible response from the brand. When it’s your mistake or consumers are experiencing a problem, acknowledge and be transparent about it. This proves you care about your clients and they hold value for your business. Wendy’s Facebook page is an excellent example of brand-customer connection. They actually take time to read and respond to their customer complaints. And, this is what makes their brand standout from its competitors! Apart from finding your audience’s preferences, tastes and behavior, social media also helps in monitoring the competition. For example, if your competitor’s product or service is lagging on some platform, you can use it to win new customers by directly addressing it. Famous brand like Nokia failed miserably when it ignored the rising demand of upgraded software. The company kept focusing on the hardware which led to its offset. In that period of time, Samsung, Sony, HTC, Apple, etc., took liberty of it and launched phones that outperformed than Nokia. Though social media marketing was not prevalent at that time, it is now. You can find various ways to map your progress as well as your competitor’s. Some popular tools for monitoring competitors include SocialMention, Marketing Gardener, SEMRush, etc. 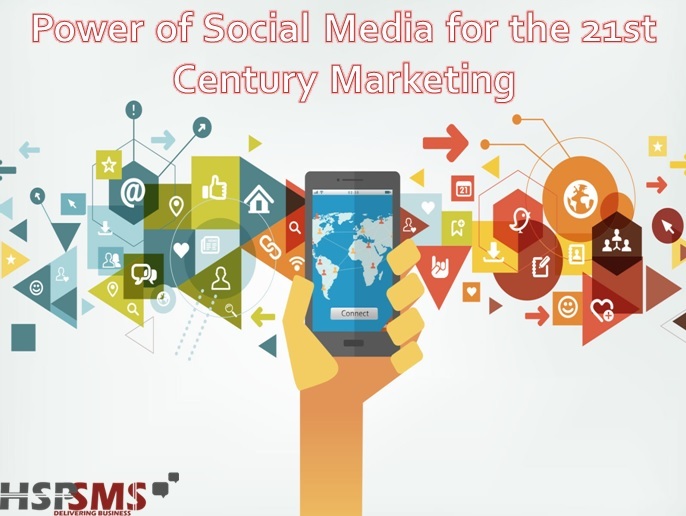 Social media marketing is here to stay! If you are still unaware of the benefits of social media marketing, then, it’s time to get in the game. The longer you wait, the more your business will suffer. However, with strategic planning and proper implementation, it can help you flourish your business.